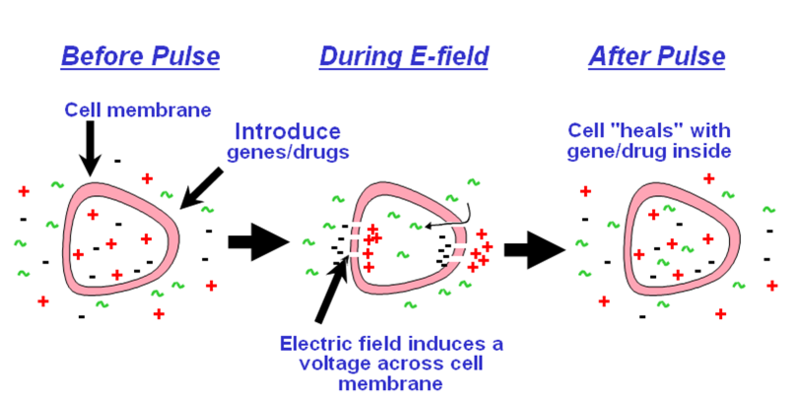 Electroporation is the application of an electrical current across a cell membrane resulting in temporary “pore” formation enabling the uptake of exogenous molecules found in the medium to either the cytoplasm (transient transfection) or into the nucleus (stable transfection), thereby transfecting or transforming the cell. Why should I use electroporation? This technique has been used to introduce plasmids such as DNA and RNA, (including siRNA) proteins, carbohydrates, dyes, and virus particles into bacterial, yeast, plant, insect and mammalian cells. Electroporation provides a highly effective alternative to other methods of transfection/transformation. Electroporation is very easy, there are no toxic side effects on the cells, the uptake of your molecule is immediate and yields greater transfection/transformation efficiencies. Electroporation, which is highly reproducible, can work with much broader cell lines or with difficult to transfect cell lines and is not limited by the size of the plasmid. What is the difference between the square waveform and the exponential decay waveform? An exponential decay wave is a waveform that is delivered then exponentially decays. This waveform is ideal when transforming bacteria and yeast. With the majority of the current being delivered immediately, the tough cell wall becomes permeable to allow the molecule of interest to enter. The square wave form differs from the exponential decay in the way it is delivered. The square wave pulse actually looks like a square. The benefit to this waveform is that it is better accepted by more delicate cells, such as mammalian cells. The square wave allows a period of homeostasis to be reached in the cells before the wave is removed. As a result, there is a lower mortality rate in cells while maintaining transfection efficiencies. While both waveforms are capable of electroporating bacterial, yeast and mammalian cells, each waveform has its benefits. Exponential decay waves will result in a higher rate of cell mortality in mammalian cells and square waves will result in lower transformation efficiencies in bacteria and yeast. What system should I use for mammalian cell electroporation? 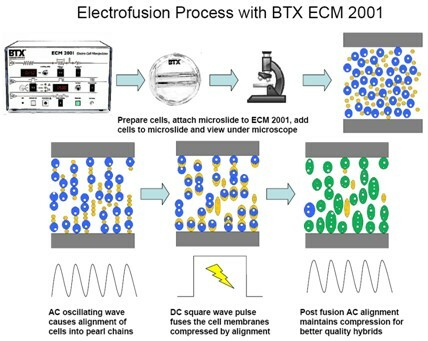 BTX offers several square wave systems that are capable of efficiently transfecting mammalian cells. The ECM 830, ECM 2001, Agile Pulse In Vivo, Agile Pulse MAX and Agile Pulse HT. The system choice will depend on what types of applications you will be running. The ECM 830 system is a general purpose mammalian cell electroporation system; it offers the researcher the ability to transfect cells in suspension in either cuvettes or 96 well plates, to perform in vivo electroporation with specialty electrodes or adherent cell transfection. The ECM 2001 was designed as a dual wave system and is primarily used for electrofusion of cells, but can also be used as an electroporator as well. The ECM 2001 offers the researcher the ability to transfect cells in suspension in cuvettes, to perform in vivo electroporation with specialty electrodes or adherent cell transfection. The Agile Pulse In Vivo system was designed for in vivo electroporation applications. It is primarily used for vaccine applications. The Agile Pulse MAX system is a large volume transfection setup for researchers working with volumes of up to 20ml. The Agile Pulse HT system is a large volume transfection setup for researchers working with volumes up to 1000ml. Call BTX sales support for help making a choice. What system should I use for bacteria or yeast electroporation? In general, we recommend using an exponential decay wave for bacteria transformation. The ECM 630 is the unit of choice to transformation bacteria and yeast. This system offers adjustable capacitance and resistance settings, the combination of which determines the time constant or time the sample is exposed to electricity. Because of the flexibility of time constant options, this system is capable of transforming both gram – and gram + bacteria, yeast, algae and plant cells in either cuvettes or in a 96 well format. BTX also offers the ECM 399 an economic exponential decay wave electroporator for simple E. coli transformation with a plasmid under 20 Kb. Can we transfer settings between square and exponential decay waveforms? Yes. Contact BTX Technical Support for a conversion chart that will guide you through the process. It is easier to convert from exponential decay waves to square waves. Can I transform bacteria or yeast with a square waveform? Yes. While the square waveform is not optimal for bacterial or yeast transformation, it can still transform the cells. That being said, the transformation efficiencies will be lower using the square waveform than with the exponential decay waveform. Can I transfect mammalian cells with an exponential decay waveform? Yes. While the exponential decay waveform is not optimal for mammalian cell transfection, it can still transfect the cells. That being said, the viability of the cells will be lower using the exponential decay waveform than with the square waveform. What are the electrical variables effecting electroporation? Waveform effects electroporation, you can choose either square waves, generally for mammalian cells or exponential decay waves, generally for bacteria and yeast. Please see section of FAQ’s discussing waveforms. Voltage is the second key to electroporation. The voltage setting indicates how much voltage your sample will receive, this is also called Field Strength and is measured kV/cm. The higher the field strength, the better the efficiencies, however with higher field strengths come a higher cell mortality rate. Pulse Length is the next electrical parameter effecting electroporation. Pulse length determines how long your sample is exposed to the voltage usually measured in usec, msec, and sec with a square wave generator. The combinations of Capacitance and Resistance (used in exponential decay wave generators) settings in conjunction with the resistance of your sample basically come up with the time constant. Number of Pulses (with the square wave generators) is the number of times you want your sample exposed to the voltage. You can also choose a pulse interval for the time between pulses to allow your cells to rest. What other factors effect electroporation efficiencies? There are many other factors affecting your electroporation besides electrical factors. Cellular factors such as growth phase at time of harvesting (should be early to mid log phase) cell density, cell diameter, cell wall rigidity and susceptibility to electroporation. There are also physiological factors such as temperature of cells, osmolarity, DNA or Plasmid concentration, quality of DNA or Plasmid, ionic concentration of buffer, and post electroporation incubation conditions. Please contact BTX Technical Support if you need more assistance in this area. How do I optimize for increased electroporation efficiencies? Optimization consists of modifying one electroporation variable at a time to reach an optimal compromise by way of transfection efficiency and viability percentage. The parameters to vary are field strength kV/cm, pulse length (msec or sec, dictated by the RC value in exponential decay wave generators), pulse number, and pulse interval. Generally, the field strength is the first variable to vary when optimizing. Please contact BTX Technical Support if you require more assistance in this area. What buffers can be used during electroporation? Researchers can use buffers with low conductivity and low osmolarity to enlarge cells and facilitate the breakdown of the membrane. The low conductivity allows users to set a lower voltage. High conductivity and high osmolarity buffers such as growth media, PBS and sucrose solution cause fairly high currents in the cuvette which could damage cells. Hypoosmolar buffers creates osmotic overpressure in the cell during electroporation. This causes water to enter the cell. The cell enlarges and the membrane expands. This leads to a reduction in the voltage applied. Furthermore, the swelling of the cell causes the cytoskeleton to break, which leads to the membrane losing its internal stability. This facilitates the electroporation of the cell and increases the efficiency of the application. The results we get in our lab are not as good as they used to be. Could it be the electroporator? Possibly. Our technical group can get you the appropriate tests to evaluate the electroporation generator you are using. If the instrument is not used for long periods of time, the capacitors in electroporation generators age and may not have the same output. In these situations, re-optimization is suggested and can usually be accomplished by varying the voltage slightly. Most reports of an efficiency decrease may be traced to changing biological parameters or technique. Electroporation is dependent on temperature, volume, buffer compositions, etc. Thus, it is wise to take a good look at these factors before exploring equipment failures. My electroporator just arced. Isn’t this dangerous? Arcing is a statistical occurrence and poses no danger to the user. The 630B safety stand will contain the arc in a closed environment. All BTX generators are "arc-proof" (short-circuit proof in the event of an arc). How do I prevent arcing? You cannot "prevent" arcing from happening, but you can minimize the probability of the occurrence by lowering the voltage or switching to a lower conductivity electroporation media. For bacterial electro-transformation, be sure to carefully follow washing procedures to remove salts. For ligation reactions dilute at least 1:5 with water or TE, or use a proven method for desalting before electroporation. Using only high-quality cuvettes can also reduce the chances of arcing. How do I prepare electrocompetant E. coli? Inoculate 1 L of rich broth appropriate for rapid cell growth with 1/10 to 1/100 volume of fresh overnight culture. Grow cells at the growth temperature and conditions optimal for the strain. Harvest when cells reach early- to mid-log phase growth (usually around OD 600 nm of ~0.5). To harvest, chill the growth flask on ice for 15-30 minutes, and centrifuge in a cold rotor at 4,000 x g for 15 minutes. Resuspend the pellets in a total of 1 L of cold water. Centrifuge as above. Resuspend in 0.5 L of cold water. Again centrifuge. If cells are to be stored frozen, resuspend in ~20 ml of cryoprotectant (usually 10% glycerol). Cells to be used fresh may be resuspended in water at this point. Centrifuge as above. Resuspend to a final volume of 2-3 ml in cryoprotectant or water. The cell concentration should be high. 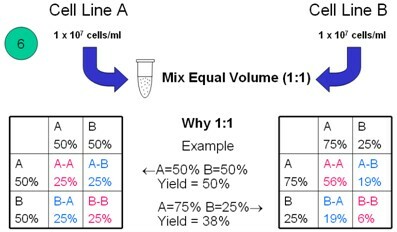 With some species a concentration of up to 5 x 1010 cells/ml is desirable. At this point, many species may be frozen in 10% glycerol and stored at -70° C for up to a year with little loss of electrocompetence. • Guide to Electroporation and Electrofusion, Chang, Chassy, Saunders, and Sowers, pg. 487, Academic Press, copyright 1992. How many times can BTX Electroporation Cuvettes Plus be used? BTX Electroporation Cuvettes Plus are recommended for single use only. The reason for this is that the metal inside the cuvette is oxidized during the electroporation pulse. In order to ensure consistency of results, a new cuvette is needed for each electroporation. With repeated use there is also increased risk of arcing and cross-contamination between samples. What is the electrical polarity of the Tweezertrode electrodes? The Anode (+) end of the Tweezertrode corresponds to the side of the Tweezertrode with the blue adjusting screw on it. Electrofusion is a combination of the use of AC alignment, DC square wave electroporation followed by post fusion AC alignment. The first AC Alignment causes the cells to align in pearl chains or dimes putting the cell membranes in contact then a DC square wave pulse is applied to cause pores to form in the cells, the third step is to apply a post fusion AC alignment which will keep the newly fused cells in contact. See diagram below. Why should I use electrofusion? Electrofusion is more efficient than PEG, results are reproducible, reliable, cost effective and optimized protocols have already been established. How does electrofusion compare to PEG ? Electrofusion is able to facilitate considerably higher hybrid yields for many cell types, up to 80 fold over PEG- mediated fusion. Significantly lower amounts of B cells are required with electrofusion. Electrofusion is faster, easier to use, more reproducible, more reliable and more cost effective than PEG. Additionally, electrofusion can be view in real-time under a microscope. What kind of cells can be fused with electricity ? Any cell type can be fused with electrofusion. How are the cells aligned in electrofusion ? An AC waveform is applied to align cells by dielectrophoresis. More specifically, an electric field induces a dipole within the cell. As cells move towards a common point, the dipoles attract and pearl-chain formation results. What are the factors effecting electrofusion ? There are many factors effecting electrofusion. Electrical parameters, the condition of the cells prior fusion, buffer and post fusion cell handling are a few of these factors. What buffers are used during electrofusion ? We recommend using the Cytofusion buffer for Electrofusion, however many labs prefer to make their own electrofusion buffer. BTX offers 2 electrofusion systems, why would I choose one over the other ? What cell density do you recommend ? We recommend no more than 20 million cells per ML for fusion. What ratio of B cells to myeloma cells do you recommend for hybridoma production ? We recommend a 1:1 ratio. What if I don’t see any cell fusion ? Contact BTX Technical Support for help troubleshooting your application. What are the volumes that I can electroporate with BTX Cuvettes Plus ? • 1 mm gap: 20 to 90 µl Identified easily with a gray cap. • 2 mm gap: 40 to 400 µl Identified easily with a blue cap. • 4 mm gap: 80 to 800 µl Identified easily with a yellow cap. Can I use other “brand” cuvettes with my BTX electroporator ? Yes, any BTX instrument will accommodate most commercially available electroporation cuvettes. How do I orient the cuvettes in the safety stand ? Each cuvette has a pair of aluminum electrodes, the metallic sides. These sides should face the metal contacts of the safety stand. Each cuvette should be wiped down of any condensation before being placed into the safety stand. Two cuvettes can be electroporated at one time in the safety stand. Can the BTX Cuvettes Plus be autoclaved ? No. The BTX Cuvettes Plus contain a polymer that will melt if autoclaved. Are BTX Cuvettes Plus reusable ? We do not recommend reusing BTX cuvettes. The small gap size of the cuvettes creates nooks for salt to build up and if the cuvette is reused, it could cause arcing. What are the HT 25 and HT 96 System ? What are the maximum volumes that I can electroporate in an HT plate ? Will my current generator work with the HT plate handler and plates ? Currently the HT plate handler and plates are designed to work with ECM 830 and ECM 630 generators. Will the HT systems work with any electroporation generator ? No. The HT system is a very powerful tool and other generators currently available cannot sustain the voltage and pulsing capabilities that the ECM 830 and the ECM 630 can. Will the HT systems deliver consistence voltage throughout a column ? Yes. The HT Systems deliver consistent voltage throughout a column giving the user confidence that the correct voltage was delivered to each well. How do I remove my sample from a cuvette or HT plate ? Initially cells should not be removed to allow them to rest. Cells should be treated carefully as they are stressed. With each BTX Cuvettes plus, there is a sterile pipette included. Use this pipette to remove your sample. In the case of the HT 96 well plates, use an 8 channel pipetter to remove the sample. Does the HT plate and plate handler electroporate one well at a time ? No. The plate handlers deliver pulses across the columns of the HT plates. What happens if an arc occurs in the HT plate ? If an arc occurs, it will only affect the cells in the column in which the arc occurred. Do I have to fill the whole HT plate with sample or can I choose to fill only certain columns ? You can choose to use as few as one column or fill the plate. We recommend using the protective sheets provided with the plates to ensure no cross contamination occurs. However, if you choose to use only part of the plate, you must ensure that each well in the columns you are using is filled, even if it’s just buffer. Can I use different volumes in each well ? No. If you fill each well with different volumes, it will effect the overall resistance in that column and could cause the time constant to vary or even cause an arc. Should I fill all the wells in a column ? Yes. If you choose to use only part of a column, you just fill the remaining wells with the buffer you are electroporating your sample in. This will ensure the resistance is within the appropriate range and avoid arcing. Does the resistance in one column affect the entire plate ? No. Each column is independent from one another. If an arc occurs in one column, the remainder of the plate can be processed as it normally would, given that it does not contain additional arc conditions within the rest of the columns. Can the BTX HT plates be autoclaved ? No. The plate contains a polymer that will melt if autoclaved. Are BTX HT plates reusable ? We do not recommend reusing HT plates. The small gap size of the plates creates nooks for salt to build up and if the plate is reused, it could cause arcing. What is the Enhancer 3000 Monitoring System ? The Enhancer 3000 is a monitoring system that allows the user to monitor their electroporation parameters to help optimize applications, troubleshoot, for recording purposes or simply for QC. Can I use the Enhancer 3000 with any generator ? No. The monitor must be used on an electroporator with external outputs. It cannot be used with the Hybrimune or the Agile Pulse systems. Do you offer academic or institutional discounts ? Since our researchers work primarily in universities, we have kept our prices as low as possible. Rather than inflate the price in order to discount to all, we have found that researchers would rather have prices based on value. So, in effect, the discount is built into the price. Does BTX offer on site application training ? Yes. BTX offers customized application specific trainings on site for a charge. Contact Us for a more information. What does ECM stand for ? ECM stands for Electro Cell Manipulation. This is the process of manipulating cells using electrical methods. What does BTX stand for ? BTX stands for BioTechnology eXperimental Research. How can I order your product if I am in another country ? Please use the Contact Us form on this website. Where is BTX located ? What are BTX’s operating hours ? How long is the BTX warranty on generators, accessories and electrodes ? The warranty on BTX generators and plate handlers is for a period of 2 years. For accessories and electrodes, we offer a 90 day warranty period. If I ordered something in error, can I return it ? If you ordered something in error, you can return it within 30 days. You may be charged a 15% restocking fee. What if I ordered a BTX system and it doesn’t work for my application ? We always recommend speaking with someone in technical support before ordering a system. If your recommended system does not work for your application, we ask that you work with our technical support department either through optimization or troubleshooting prior to returning the setup. If you are still unhappy with the result, you may return it for full credit within 30 days. My generator is under warranty and I believe it’s malfunctioning. How can I get it repaired ? Please contact BTX Technical Support in order to determine if it is your generators that is malfunctioning or some other factor causing issues. If it is determined that your generator is not functioning properly, we will issue an RMA number (Returned Materials Authorization). You cannot return the generator without this RMA number. If you attempt to return a unit for repair without an RMA number, the unit will be returned to you as we cannot received it here without proper paperwork. You are responsible for the cost of sending the generator to BTX in Holliston MA. Make sure that the unit is packed well, preferably in its original casing to ensure no further damaged is caused in shipping. Once received, BTX engineers will evaluate and repair your unit quickly. BTX will then send the unit back to you. My generator is NOT under warranty and I believe it’s malfunctioning. How can I get it repaired ? You must complete a Return Materials Authorization form (RMA) and follow the instructions in our Return Policy. I dropped my 1 year old generator and it’s not working, does the warranty cover repairs ? No. The warranty covers manufacturing defects only. Can I send my system in for routine calibration ? Yes. BTX does offer a calibration service for a fee. Please Contact Us for a quotation. Once the unit is received in house, it is a first come first serve basis. Typical repairs take 1-2 weeks from date of receipt. Repairs can be expedited in certain situations. Can I receive a loaner system while my generator is being repaired ? Yes. If your generator is under warranty, and you cannot be without a system, BTX will gladly send you a loaner unit during the time that your unit is being repaired. Again, this service is offered on a first come first serve basis as BTX has a small inventory of loaner units. If your unit is not under warranty, you may still request a loaner unit, however warranty cases will take priority. BTX must secure a PO for the unit prior to sending it out. I am looking for a service manual. Where can I get one ? BTX Does not provide service manuals. Due to the nature of these electrical units, we do not recommend that anyone open these units and attempt to work on them. If a unit is opened, this will void your warranty. BTX does not accept responsibility for any persons who attempts to alter or service any BTX generator. If I email your website for technical help, how long does it take to get a response ? The typical response time is 24 hours for any technical request. Any requests received Friday afternoon after 5:00pm will be answered promptly on Monday morning. Will BTX provide references if I ask ? We will do our best to provide you with any references that you require. We have a database full of customers who are happy to share their experiences with you. I am working with a protocol that references a publication. Can I get a copy ? Yes. Simply provide the protocol number and we will do the rest. You can receive faxed, emailed (PDF) or mailed copies. I am looking for a user’s manual. Where can I get one ? User manual are sent out with each generator on CD. If you do not have the CD, most manuals are available in the Resource tab on the webpage for each system.